John is retired since 2002 from a wide-ranging engineering career. He has a degree in Physics from the University of Manchester in England, but has always been an engineer. He emigrated to Canada right after graduation, where he was notably designing satellite communications and was project engineer for the ISIS satellites. He emigrated to the USA in 1968 where he worked in the defense industry for many years as a systems engineer, with a speciality in multiplexing for aircraft and ships. During his last six years he was a Software Engineer programming in Ada and C++. If you want to learn more, look up his resume. Since retireing John and his fourth wife Elaine have been enjoying the good life in the balmy climate of San Diego, California. Their modest means nevertheless has supported a lot of travel by car, RV and cruises (but not air), with an average of nine trips a year. Elaine is an accomplished artist and keen gardener. John keeps busy making little electronic projects in his garage workshop and carpentry. Most of these projects use Parallax Stamp or Revolution Education Picaxe micro-controllers with embedded Basic interpreters. He writes up these gadgets and posts them here. If you have an interest in John's private life, you should be warned that he is a Naturist. 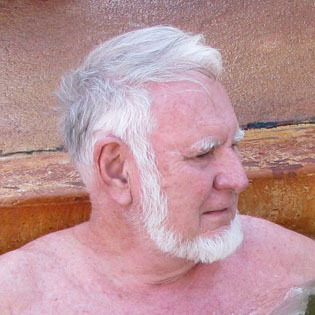 You can see his illustrated autobiography, his trips before retireing, some historic photographs about San Diego's de-facto clothing-optional Black's Beach, and their trips since his retirement, with candid photographs, here.